The Kimball House was a hotel. In 1880, when the telephone exchange was opened, it was the largest building in Downtown Atlanta. During this time, telephone offices were installed in buildings like this in many cities. The office was on the top floor so that the wires could leave the building through the roof. The first equipment most likely consisted of a small magneto switchboard. The initial name was "The Atlanta Telephonic Exchange". In 1882, the address became 21 1/2 Marietta Street. This was probably due to street changes occuring in the downtown area and not necessarily due to a relocation of the hotel. On August 12, 1883, the Kimball House was destroyed by fire. It was rebuilt. In 1884, Long Distance service to Decatur was available at 15 cents for 5 minutes. In 1894, the Kimball House switchboard was closed, all service was moved to the new Pryor Street building. In 1959 The Kimball House was torn down. [-1895_pryor]This was the site of Atlanta's second central office switchboard and the first building constructed specifically for the telephone company. When it was opened in 1894, in addition to the switchboard for the Atlanta telephone exchange, the building contained the Atlanta Toll switchboard and was the headquarters of Southern Bell Telephone & Telegraph Company. In 1900, the building was expanded. Although details are not known, around this time, it is likely that the magneto equipment was replaced with common battery equipment. Since this was common in other cities. In 1906, when Southern Bell opened a second office north of downtown, the office was officially called "Main" to distinguish it from the other office, "North". In 1928, the central office switchboard in this building was retired when the Main office was taken over by new dial equipment in the Auburn Avenue building. The Atlanta Toll switchboard remained here for another year until the 51 Ivy building was completed. After 1929, the building was sold to Fulton County to add to their courthouse complex next door. This was a very short-lived office, located in Midtown. It was only open for about 8 years. The first address in 1900 was listed as 30 E. North Avenue. 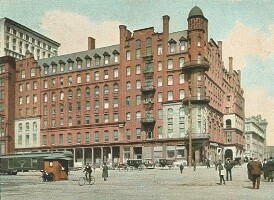 In 1905, the address is shown as 18 E. North Ave. In 1908 the office appears to have been closed. It is assumed that the customers served by this office were originally served by Main or Ivy. Following the closure of this office, they were probably moved to Ivy, since that office opened the same year. This was an early office built in 1897 by Atlanta Telephone Company. This address may have been an office only and not a telephone exchange. In 1899, when the Edgewood Avenue "Main" office opened, this office was no longer listed. This was Atlanta Telephone Company's first central office. The Atlanta Telephone Company was a separate company in competition with Southern Bell. They were in business from 1897 to 1920 at which time they were bought out by Southern Bell. The building opened in 1899. At this point the address was 104 Edgewood Avenue (after Ivy Street intersects). In 1902, the address was shown as 1021 Edgewood Avenue and in 1905, it is listed as 75 Edgewood (corner of Ivy). This could have been two or three different addresses or simply a renumbering of the street. The building appears to have been torn down in 1921. The office was in service during 1909 but there is no further information available. It is assumed to have been on the Northwest side of town. The office was in service during 1909 but there is no further information available.